Palestine is in the air; warm at first and then chilling at night. Chirping and barking from towns and cities. An energy, swirling ceaselessly over endless hills. Square-windowed boxy buildings are stacked all round, pixelating tiered contours. Some just started, some are finished and some in between; columns up-stretched waiting patiently for another floor. All of them with flat roofs, crammed with water tanks and solar panels. The Palestinian Museum is a new neighbour in this landscape. It is familiarly stoney and pale, but conspicuously cranked and low and uneven. A warped monolith; emerging from a skirt of sloped gardens. It is mostly single-storeyand stretches itself out narrow on the hilltop. Lying long from south to north, watching over the village of Abu Shukaydam below it to the west and then on beyond the hilltops to the Mediterranean Sea. The site is being scraped and straightened along existing levels; staked to new coordinates. For months now, masons have been gathering stones from site; chipping then stacking them one on top of the other. Zigzagging their way eastwards and upwards from the bottom of the hill, tracing new land lines with low retaining walls. Between them, heaps of clayey soil are dumped; then spread and raked. Slowly lofting ancient land into triangular gardens; new, but strangely recognizable. The workers outside wear soft hats and take their breaks spread out under rock outcrops. Blue and black plastic bags, bundles of round bread, tins of meat, olives, white salty cheese and coke bottles by the neck. Already they have planted groves of almond, apricot, pomegranate, mulberry and cypress trees. From Qalqilia, in groups of two and three, they are dragging heavy olives trees into fresh pits. These will be followed by walnut, carob, fig, judas, terebinth, sour orange and lemon, ending with a blurry edge of pine and oak at the site boundary. Below them a thick carpet of wheat, chickpea, mint, za’atar, and sage are already blooming. Yet to come are a swath of salt bush, hawthorn, rockrose, chamomile, caper, thorny broom, quince, jasmine, lavender, bay, myrtle, marjoram, geranium, wild pear, butcher’s broom, rosemary & grape. Herbaceous perennials of giant globe garlic, lily of the Nile, bearded iris, sea squill and mallow will be bedded down before the end of the year. Rounded pebble is being sponged smooth over ramps, paths and steps. A slow, slicing network. Along the roadway massive concrete pipes and steel tubes are slung into deep trenches; overlooked by bunches of men. Coaxed together; they will bring electricity, gas and water into the site and drain unused rainwater back downhill to the wadi’s. At the top of the hill, the last of the concrete is already poured and hardened. Slabs laid first and then hulking frames cast across the short direction; up, over and down the far side. They hold up two huge triangular openings to look back down over the site to the west. Nineteen frames, each frozen in unique poses. They are all stitched together with a thin concrete underbelly; leaving ribs exposed above to carry a skin of stone. Massive stones, hewn from Bethlehem, are heaved into unfamiliar places by cautious Nabulsi heads and hands. Slab by slab, wrapping the building whole. Still, large pieces of the building lie in waiting to be called up; craned into place and then bolted or bedded down. Next it will be the glass; dancing its way in and out from the building from one end to the other and facing west, triangularly. Finally an array of slender black steel shades will slot into place – to blinker low hot evening suns. Twine guidelines are stretched taut from the building edge, barely visible. More cut stone is dropped into place between them onto wet cement by men kneeling on cushions. Grey and marbled, staggering its way across the terrace. In the outbuildings, masked welders are joining thick steel pipes and bolting pumps and compressors to concrete plinths. Inside, lengths of thick black cables lie on the floor slabs in strands and clumps, coursing around the building. In rooms here and there fine coloured strands are now being drawn out of them and are tagged; connecting panels with switches and sockets with buttons. Soon they will be buried under a thick wet screed, once hardened it will be lined itself in stone or tile or carpet. Endless currents, flows and signals will race back and forth underfoot once the building is finished. Overhead, plasterers scrape graining slurry onto the concrete shell. Below them others silently glide thin layers of chalky gypsum onto inner walls. In the toilets a man is tamping thick terrazzo tiles in place; butting them tightly one to the other. Shiny taps and sinks and toilets are on their way. 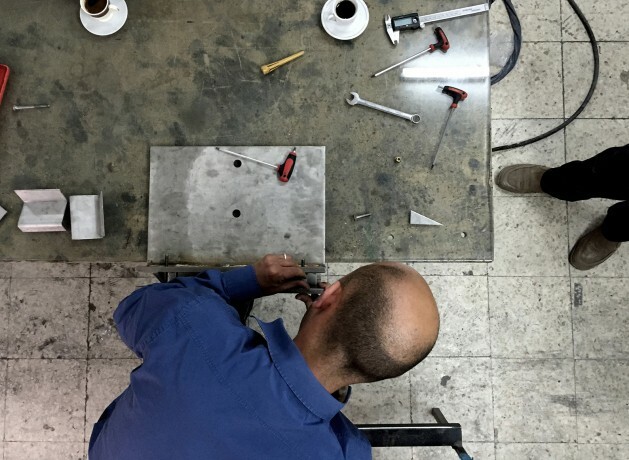 Off-site, in workshops on the outskirts of Hebron and Nablus, the finer details are being fine-tuned. Metal sheets are folded flush and powder-coated. Thick stainless steel plates are cut and clamped. They will be brought to site later, unwrapped and gently torqued into place. Constant talk and argument oiled with cardamom, sage, mint, ginger or chamomile and sustained with patience and humour. Then the sun sets, slowly lowering itself into the sea again. A last act, headlong and centre stage in front of the museum; it is watched over from the roof, and the galleries and the gardens. 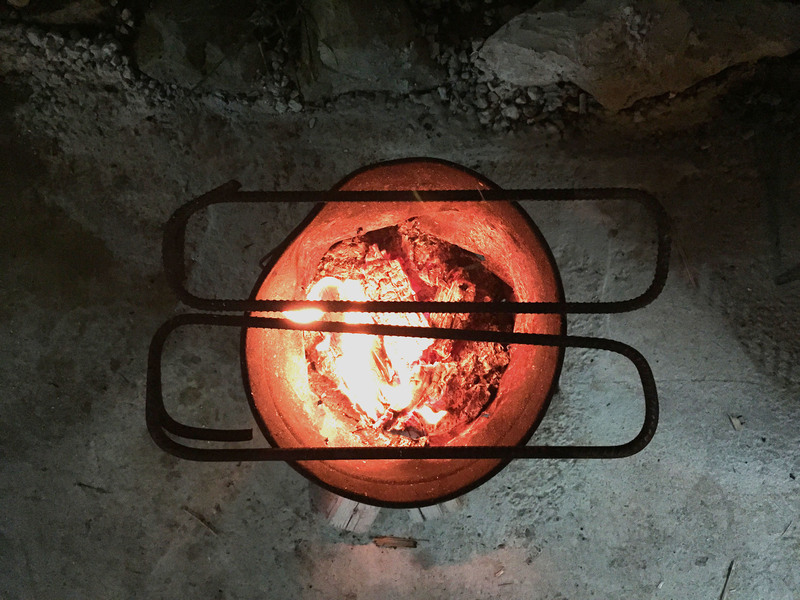 A stove is assembled with an empty barrel and some spare rebar, it is fueled with spent timber form-work. Clear plastic cups are unstacked, spoons wiped and hands washed. Steaming turmeric rice is circled out on to one huge, bread-lined, battered steel plate. The Mansaf bubbles, it is almost done and soon it will be tipped out. Cups of its sour, milky juice will be poured over the heap; soaking deep into the rice below. Then it will be eaten, together. Afterwards in the dark there will be cups of Turkish coffee and cigarettes and chatter. Enough is a feast. The construction; an exchange of foreign notions and Palestinian values, of long term hope and mutual risks. The Palestinian Museum has been designed by Heneghan Peng Architects, Dublin, Ireland. The construction of the Museum began in October 2013 and will be very soon complete.